A Book Buddy That Barks | Kid Reporters' Notebook | Scholastic Inc.
Have you ever found reading to be such a daunting task that you dreaded it? If so, you're not alone. A recent study by Scholastic Inc. found that only 51 percent of kids (ages 6-17) read for fun. Still, reading is known to increase knowledge and vocabulary, improve brain function, and contribute to academic success. It can also be fun! To get kids to open their books, the Acton Memorial Library in Massachusetts has instituted an innovative and kid-friendly approach. 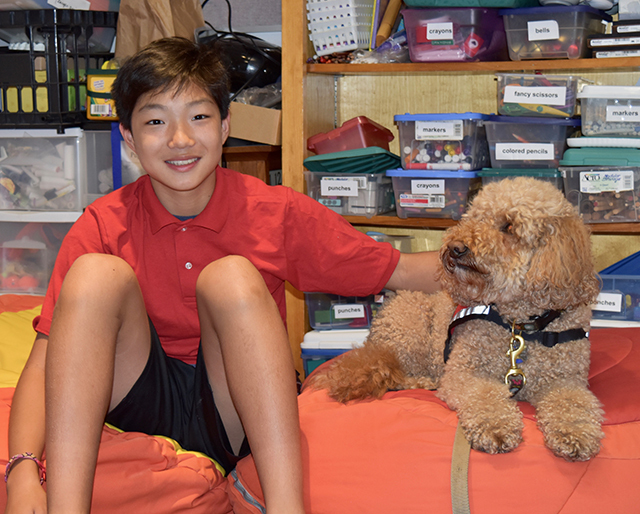 Children can make an appointment to read to a friendly therapy dog named Molly. Molly visits the Kunta Kinte-Alex Haley Memorial in Annapolis, Maryland. Not all dogs can become therapy dogs. Dogs like Molly, who is an Australian Labraoodle, are trained to be gentle, attentive, and patient. Most important, reading dogs must have little to no temper. “When Molly was very young, about eight months old, she started taking a puppy kindergarten class, and then two behavior classes, and then an advanced attention class,” Piper says. “She went through a total of 10 puppy-training classes and had to pass numerous tests." Do you think that reading to a therapy dog would get you reading more? Why or why not? Molly, a trained therapy dog, reads at the library.